A.V. 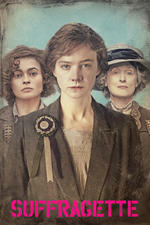 Club: "Despite a top-shelf cast and strong subject matter, Suffragette feels like the product of limitations." A.O. Scott (NYT): "'Suffragette' also avoids the all-too-common tactics of placing a sympathetic member of the oppressor class at the center of the drama or making it all about the awakening of a man’s conscience. Instead, it shows the limits of solidarity even when the sympathetic ties of family or class are involved. It also underlines the viciousness with which power reacts when it is challenged." I wish that the plot had focused more on the Pankhursts. The interview with Abi Morgan (the writer) on Kermode and Mayo was excellent, and it made me very interested to see this film.